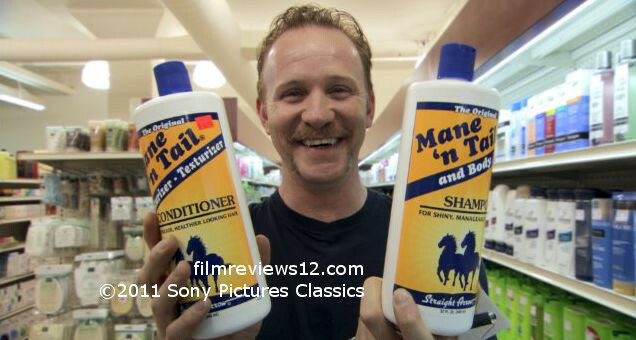 Mane ‘n Tail shampoo — it contains separate instructions for human and animal use, apparently. Part two of a six part examination of various recent documentaries, which I expect to finish by the end of the month. Everyone’s heard the story about how during the filming of E.T., the studio sought the permission of the manufacturers of M&M’s to use their product in the scene where Elliott lures E.T. upstairs. Mars, Inc. says no, but the Hershey Company, hoping to promote Reese’s Pieces, gladly allow the insertion, and upon the film’s release, sales of Reese’s Pieces go up over seventy percent. It’s product placement at its finest and most effective. Ah, product placement. Advertising. It’s everywhere. This is the point of Morgan Spurlock’s The Greatest Movie Ever Sold (or POM Wonderful Presents: The Greatest Movie Ever Sold, more on that later), a funny and fascinating look into how this kind of thing works. The film focuses on itself, as Spurlock goes around to various companies, looking for funding for his project in exchange for using and showing the products in return. Every cent spent on this movie comes from corporation dollars. As Spurlock picks up more and more sponsors, what he does becomes more limited. This is both a comedic element for the viewer and an impediment on exposing any real jawdropping truths. He takes us through the contracts: Every drink he’s seen drinking must be of the same brand, every food must be a brand of frozen pizza, every hotel used a Hyatt, and don’t even think about saying anything against the country of Germany. The biggest ad spot costs $1 million, and will be the most heavily featured, appearing in every way possible and above the title on promotional material. The buyer is POM Wonderful, manufacturer of pomegranate based fruit drinks. Indeed, their hourglass shaped bottles are constantly visible on tabletops during meetings and interviews. He even films a few 30 second commercials for them, shown throughout the picture. He also shows us different aspects of the film’s advertising, down to designing the posters. By the end of The Greatest Movie Ever Sold, you feel like a pawn of commercialism. You recognize the constant bombardment of advertising that faces you wherever you go (unless you live in São Paulo, Brazil, where outdoor ads are banned; a facet highlighted within the film). The intertwining of entertainment and commerce has plainly existed since the dawn of both, but it’s amazing how much of it we choose to ignore. At 87 minutes, the movie comes in slim. While the DVD copy I received contained no special features, regular retail editions contain nearly an hour of deleted scenes. It’s worth wondering whether a longer version of the film may have contained more interesting and new information. There’s nothing particularly wrong with this movie as is, but most viewers with a decent amount of knowledge on the subject of advertising and product placement won’t learn much that they didn’t know before. The interviews sometimes feel overly abbreviated. It’s a shame, because a wide variety of people are reached out to: from filmmakers like J.J. Abrams and Quentin Tarantino, to politicians, such as Ralph Nader, and businessmen like Donald Trump, who has unfortunately tried to be a politician. The Greatest Movie Ever Sold takes an interesting topic and approaches it in an ingenious way, but it never really reaches its full potential. It’s amusing in its own right, but no groundbreaking ideas or facts are ever presented. Watch it, but don’t expect anything too great.